On a wet, cold, winter day, there is nothing better than a steaming hot bowl of soup, stew or curry. Green Papaya is the place I go to get just that. During this visit, I take home a large bowl of chicken wonton soup ($8). Although a tad bit pricey for what you get, the wontons are surprisingly fresh and plump with ground chicken and mild spices. Fresh button mushrooms and celery add a nice refreshing tone to the broth. I also take-away a bowl of thai green curry with vegetables ($11). 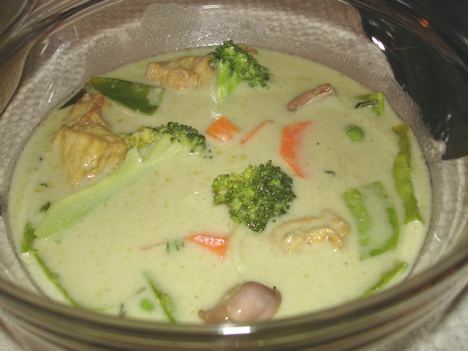 The coconut milk takes control of this dish, leaving the green curry flavour as a mere aside - very mild and toned down. The curry is loaded with fresh veggies - broccoli, carrots, snow peas and mushrooms. Large pieces of tofu are also added into the mix, although they are a bit chewy by the time I get to eat it. Other great items on the menu include 11 different types of Pho, six more soup dishes, and a plethora of vegetarian dishes. PS. Get 10% off when you take-out and pay in cash.